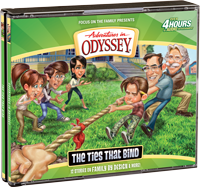 If you’ve been anxious to hear what’s coming up from Adventures in Odyssey, you’ll soon have a chance to hear Album 58 (The Ties That Bind) before it airs on the radio and before the official release of the digital download and CD. If you’re not a member of the Odyssey Adventure Club, episodes from The Ties That Bind will begin airing on September 6, 2014. Digital downloads will become available in September with the CD copy to follow in October. You can get a sneak peek at the series via the Official Podcast. Focus on the Family has released the first episode of the album to whet your appetite. Stay tuned as we bring you more news regarding Album 58. There’s no greater time to be an Adventures in Odyssey fan as the show is more accessible to more audiences than ever before!